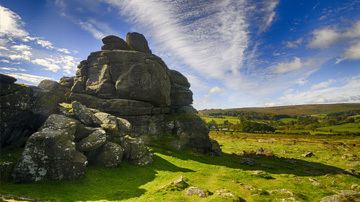 In 2005, Andy Crabb, Dartmoor National Park Authority and English Heritage archaeologist, became seriously concerned about the condition of the piles of rock which are seen on the summits of many of Dartmoor’s tors. Stones were being moved and the danger was that fragile archaeology below the upper layers of stone could be damaged or disturbed. Once disturbed, archaeological context is lost and any artefacts become of very little scientific value. These summit cairns are not the random piles of rock they may seem. Current archaeological theory suggests that these are among the earliest monuments on the moor. They are at least 4000 years old and probably had two main functions – to cover and mark cremation burials and to mark territory and act as landmarks. Most of the summit cairns are listed ancient monuments. To protect the underlying archaeology, Andy identified the damaged cairns as ‘at risk’, and looked around for a remedy. He knew of the DPA’s successful use of volunteers on the bracken project and asked if we could help. The DPA gladly accepted the challenge, and Anne Whitbourn mobilised what was initially a small band of volunteers to survey the cairns in detail, repair areas of modern damage and ensure that the cairns are properly recorded on the Historic Environment Record (HER). 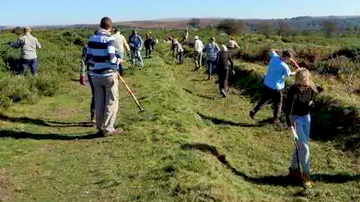 The last ‘at risk’ cairn was completed on Cawsand Beacon in September 2010. All the cairns have been surveyed in detail and the necessary repairs have been undertaken with sensitivity, under the guidance of Andy who was able to remove his entire original ‘at risk’ cairns from the endangered list. I understand from Andy that, following a meeting of the Council for National Parks where he showed the DPA survey drawings to his colleagues from other areas, at least two other National Parks have initiated similar projects with volunteers. It seems we are regarded as examples of best practice. The main legacy of the Cairn Restoration Project, apart from the protection given to fragile archaeology, is the permanent record to be set up by the completed survey plans, photographs and written information. These surveys are the only detailed record known to exist for most Dartmoor cairns. On the HER they will be available for public and professional research, and for the protection of these monuments in future. The DPA’s conservation team regularly carries out conservation work on archaeological and heritage sites all over Dartmoor. The pause while we finalise the cairn project will not last long and we will soon be surveying again. The conservation work continues all the time and we welcome new volunteers. 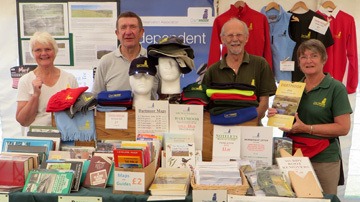 The volunteers are a friendly crowd, always willing to pass on their knowledge and skills. 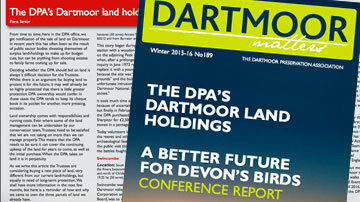 If you are interest in joining them, please contact the DPA office on 01822 890646.